Eleven-year-old Hansen Prabhudas of the Bangalore Second Branch, Bangalore India District, was excited. After church the older boys in the branch would be teaching him how to prepare, bless, and pass the sacrament. First, the boys who are teachers in the Aaronic Priesthood showed Hansen how they prepare the trays of bread and fill the cups with water. Next, the priests read through the sacrament prayers and explained how they fold the tablecloths. Finally, the deacons showed where they stand, how they pass the sacrament to the congregation, and how they help everyone be reverent. Besides learning about the sacrament, Hansen is reading the scriptures and trying to keep the commandments and obey his parents. He’s also learning about the Church in Primary and setting a good example for his nine-year-old brother, Gideon. His father also helps Hansen’s mother with shopping and cooking. “He does everything he can to help us,” Hansen says. And both his parents help many people, especially in the Church. Hansen’s mother is often busy with her calling as branch Primary president. Hansen lightens her load by going to buy vegetables or by washing the dishes. Hansen’s favorite scripture story is about Noah. “I love how the animals obeyed him when it was time to get on the ark.” He knows Noah had to do a lot to prepare for the future, just as Hansen has a lot to do to prepare for the priesthood. Raising fish: Hansen hatches guppies in a rainwater bucket he keeps behind the family’s apartment. Then he transfers them to a small aquarium. “I like the many beautiful colors and how the fish play with each other,” he says. Singing: “Love Is Spoken Here” (Children’s Songbook, 190–91) is Hansen’s favorite Primary song. He and Gideon love to sing songs about Jesus, especially hymns. “Hymns help us keep love in our family,” Hansen says. 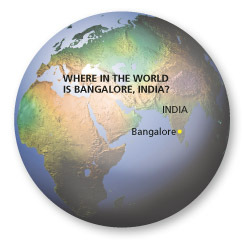 Where in the World Is Bangalore, India? Map by Mountain High Maps, © 1993, Digital Wisdom, Inc.
Hansen is learning about setting a good example in various settings: with Aaronic Priesthood holders in his branch, during family home evening, playing soccer, and preparing food with his younger brother, Gideon.